CropStop: Vintaj by Sizzix Ellison! What would you do with the new Sizzix Ellison, "Vintaj" Natural Brass Embellishments? Visit the CropStop Store Fan Page on Facebook and leave a comment by noon today! Hurry, there's not much time! The CropStop Store has these beautiful Vintaj Embellishments in stock just waiting for you to grab them up for your creative projects!! 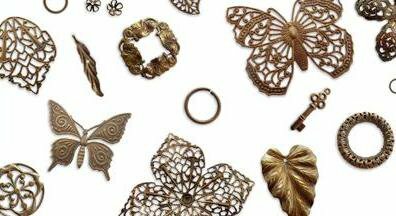 Made by Sizzix Ellison of natural brass, you can alter them to meet your crafting needs! Here are just a few ways to use them...emboss, ink, paint, link, fasten, string, and glue! Visit the CropStop Store and check out these fabulous and elegant embellishments. Grab the August discount code from the blog sidebar for 10% off your total purchase of $30 or more excluding shipping!